Jennifer M. Shaffer | Spiritual Intuitive | Psychic Medium Investigator Expert – Into the Light: by John Lerma, M.D. Home/Suggested Reading / Spirit Homework/Into the Light: by John Lerma, M.D. Despite our advancements in science and medicine, death remains one of human civilization’s most glorious mysteries. A handful of doctors have written books on phenomena such as near-death experiences, but research and data is scarce on pre-death experiences. Because of this lack of information, Dr. John Lerma has devoted his career to compiling anecdotal and scientific research on pre-death hallucinations from the countless terminally-ill patients he lovingly cares for as a doctor and director at The Medical Center of Houston, Texas. 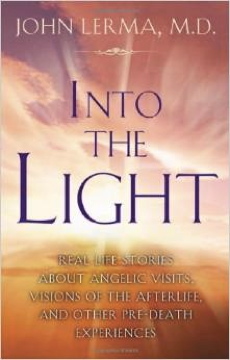 Now, in the groundbreaking book, Into The Light, Dr. Lerma shares his valuable research and guidance in 16 inspirational stories of children and adults confronting their deaths through the comforting visions of divine beings. By presenting these mysterious visions, synchronicities, and angelic conversations terminally ill patients encounter, Dr. Lerma shows how knowledge of death can ease the pain and fear as we prepare to enter into the light. * The exhilarating and calming elements of pre-death experiences. * Healing during the dying process. * The difference between hallucinations and visions. * Self-forgiveness and self-love as the key to a joyous life and a peaceful transition. The mystical experiences described here delve into: the creation of the universe, past and future extinctions, dark angels and white angels, selfless suffering and its effect on humanity, free will as the vital ingredient to create on earth and in heaven, and many more incredible revelations. The poignant stories in Into the Light will leave you feeling uplifted in faith, hope, and love. iTunes Audiobook -Buy Into The Light, by John Lerma M.D.